Looking for the ideal small desk or table fans for your small room or office? Well, you will actually be surprised at what the market has to offer; hundreds and hundreds of models. So how do you select the right one from all these available options? Well, to help you in your selection process, we have narrowed down the search to only models that we think are the best in terms of design, cost, and performance. A lot of research has been done to come up with this list. Therefore be assured that any model you choose will be worth every penny you spent. The sleek and stylish design of this fan will definitely adorn any surface on which it is placed. The fan operates on either DC or AC, which makes it a more flexible option for those on the move. It features a 5-blade design that measures 10 inches in diameter. The fan has 2-speed settings: low and high speed. It is ultra-quiet and comes with an integrated handle for easy transportation. Vornado is a great innovator in the world of fans. 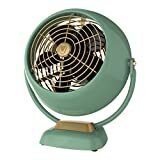 This table fan is one of its top models that utilize the company’s renown Vortex Technology to deliver maximum airflow. The fan has two speed settings: low and high. Unlike most conventional models, it incorporates a swivel design that allows for maximum coverage. The grill can easily detach for hassle-free cleaning. This is yet another stylish fan designed by O2 Cool. Like most of the company’s models, it operates on both DC and AC. It comes in a compact size and can be folded for convenient storage. The fan can be set to either low or high speed. It can easily tilt to direct airflow where it is needed most. It is a light fan that comes with a carry handle to allow for easy transportation. Lasko enters the competition with its advanced 12-inch fan. This is a stylish fan that is designed to blend well with any decor. The fan can be set to 3 different speeds: low, medium and high. It features an oscillating head that can easily tilt back to provide directional airflow and maximum coverage. The plug is fused to protect the fan against the power surge. This fan features an easy tool-free assembly for added convenience. 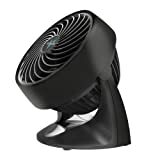 Vornado comes again with its classic air circulator. Unlike most fans, it is made of metal to ensure maximum durability and performance. Maximum airflow is guaranteed by its state-of-the-art Vortex Technology. 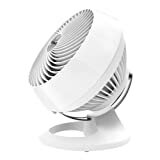 The fan has a pivoting head that facilitates multi-directional airflow. It can be set to 2 different speeds: low and high. The fan runs quietly and comes with Vornado’s a 5-year limited warranty to cater for any defects. Home Comfort 90406 is a perfect choice for those that desire durability and great performance in a table fan. 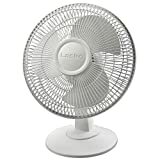 This medium sized 12-inch fan comes in an all-metal construction to provide worry-free operation. It has a powerful motor that can be set to low, medium and high speed. The fan head can easily tilt and oscillate at an 85-degree angle to guarantee maximum coverage. The base features rubberized feet that keep the fan from moving about. Hunter 90400 is yet another notable model from Hunter. Like the 90406, it is entirely made of metal to provide many years of use. The fan speed can be adjusted to 3 different levels: low, medium and high. The head oscillates smoothly and allows for maximum coverage. The fan has an advanced dust repellent mechanism that functions to eliminate 50-percent of dust. It is a portable fan that comes fully assembled. This is a lightweight fan designed by O2-Cool. It weighs at only 3 pounds, which makes it a more portable choice for travel. Like most of the company’s fans, it operates on both DC and AC. When fitted with new batteries, this fan can run continuously for up to 72 hours. The good thing about it is that it can easily fold for convenient storage and transportation. Elegance and exceptional performance are what gives this fan an edge over other rival models. This fan is really a beauty and will look amazing when placed on top of your table. It offers ease-of-use through its simple electronic control. All you need is just push the button and you are good to go. The fan is super quiet and can be set to 4 different speeds. The fan generates a minimum and maximum airflow of 257 CFM and 584 CFM respectively. It is backed by a 5-year limited warranty. Great power and performance is something you are always guaranteed when it comes to Rowenta’s VU2531 Turbofan. This 12-inch fan comes with a powerful 5-blade design that generates a whopping 1,695 CFM of airflow. It incorporates a 4-speed setting that enables you to easily regulate the amount of airflow. With a minimum and maximum noise level of 38dba and 55dba, it ranks as one of the quietest in desk fan category.